On January 15th 2015 the Swiss National Bank (SNB) has announced an end to its three year old cap of 1.20 franc per euro. (The SNB introduced the cap in September 2011). The SNB has also reduced its policy interest rate to minus 0.75% from minus 0.25%. The Swiss franc appreciated as much as 41% to 0.8517 per euro following the announcement, the strongest level on record – it settled during the day at around 0.98 per euro. We suggest that the key factor in determining a currency rate of exchange is relative monetary pumping. Over time, if the rate of growth of money supply in country A exceeds the rate of growth of money supply in country B then that country’s currency rate of exchange will come under pressure versus the currency of B, all other things being equal. 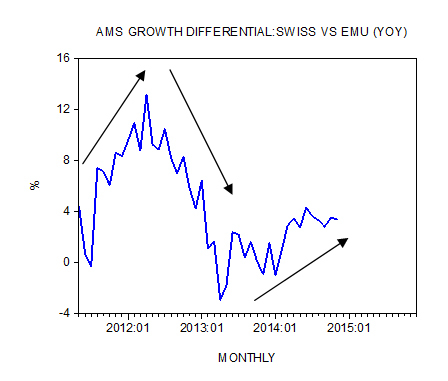 We hold that until now the rise in the money growth differential between Switzerland and the EMU during July 2011 and April 2012 was dominating the currency rate of exchange scene. (It was pushing the franc down versus the euro).The setting of a cap of 1.20 to the euro to supposedly defend exports was an unnecessary move since the franc was in any case going to weaken. The introduction of the cap however prevented the arbitrage to properly manifest itself thereby setting in motions various distortions. (Note again the money growth differential was weakening the franc versus the euro). A fall in the money growth differential between April 2012 and April 2013 is starting to dominate the currency scene at present i.e. it strengthens the franc against the euro. So from this perspective it is valid to remove the cap and allow the arbitrage to establish the “true” value of the franc. (This reduces the need to pump domestic money in order to defend the cap of 1.20). Observe that as opposed to 2011, this time around, by allowing the franc to find its “correct” level the SNB it would appear has decided to trust the free market. Note that since April 2013 the money growth differential has been rising – working towards the weakening of the franc versus the euro – and this raises the likelihood that the SNB might decide again some time in the future on a new shock treatment. We hold that by tampering with the foreign exchange market the SNB sets in motion fluctuations in the growth momentum of money supply (AMS) and this in turn generates the menace of the boom/bust cycles. (Note the close correlation between the fluctuations in the growth momentum of foreign exchange reserves, the SNB’s balance sheet and AMS). Also, observe that by introducing the cap and then removing it the SNB, contrary to its own intentions, has severely shocked various activities such as exports. Note that the SNB is supposedly meant to generate a stable economic environment.